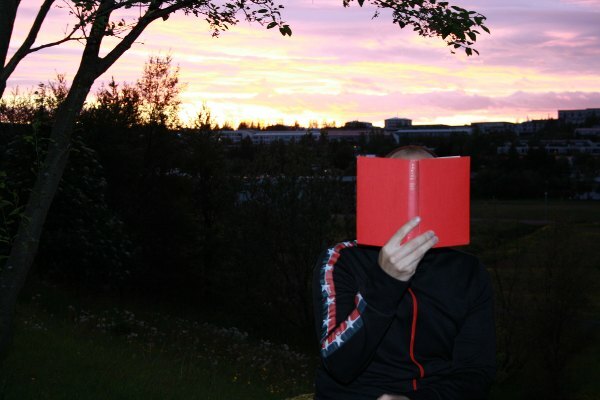 Reading outside, by the light of the midnight sun. Yes, the photo is taken at midnight. And yes, I was able to read perfectly well. Iceland is positioned in such a way that in June the sun shines almost perpetually. I am writing this now, just after midnight and I hear birds singing and the sun is painting the underside of the clouds a pale pink. That book, for the curious, is 100 Best Poems in the English Language. It is one of those mysterious books I own that I am still not sure actually exist, because the internet has little trace of them. Here is a poem from the book that I feel fitting for now, though I am not in the least religious. I have several of those books at home…the kind that the internet seems to have forgotten. And Iceland….yes, I’m envious. I have a book on writing that the internet seems not to know about. It is the source of all my powers. Johann, following your blog now. Good luck with your project Sand and Glass. I like its picture on the right too. You know, my best drawings are somewhere in Iceland, if they still exist. The picture is the work of the very talented Michael Whelan and is used without asking. I used to spend summers in Alaska when I was a child, and I remember the midnight sun. It’s odd to never have complete darkness, it makes you feel like you’re never out of time. Yes, it does. I stay up later as well but don’t feel as tired in the morning as during winter.